A cataract is a clouding of the eye’s natural lens that typically occurs as we age. The lens, which lies behind the iris and the pupil, can become cloudy as we age, in turn interfering with our ability to see clearly. Cataracts are the most common cause of vision loss in adults over the age of 40 and are also the primary cause of blindness. If you are experiencing cloudy or blurred vision then cataract eye surgery may be the procedure to help you begin seeing clearly again. How is Traditional Cataract Surgery Performed? 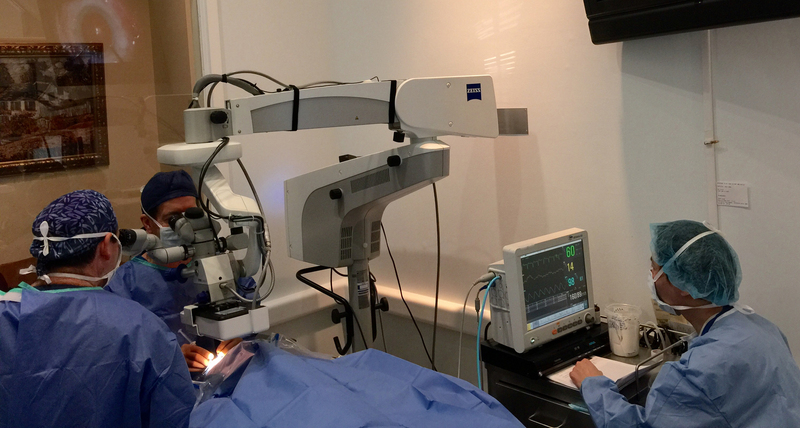 Cataract surgery is one of the most common procedures that our Toronto eye specialists perform at the Bochner Eye Institute. Traditional cataract surgery is complex, but safe and extremely effective. Cataract surgery begins with a tiny incision in the side of the cornea. Ultrasound waves are used to break up the clouded lens so that it can be removed. Through the same small incision, the eye surgeon inserts an intraocular lens (IOL) to restore vision. The incision is so small that the eye tissue usually heals itself. Cataract surgery takes approximately 20 minutes per eye and has a very quick recovery time. The procedure is performed on an outpatient basis and most people return to normal activities within a week following the treatment. The cost of cataract surgery in Toronto, Canada will vary depending on a number of factors including the type of lens used, the surgeon’s fee, and insurance eligibility. For a personal price estimate, schedule a consultation with the talented eye surgeons at the Bochner Eye Institute. A: A cataract is a cloudiness of the eye’s natural lens, which lies between the front and back areas of the eye, directly behind the pupil. Q: Are cataracts found only in older people? A: Most cataracts develop slowly over time and affect people over age 50. About half of the population has a cataract by age 65, and nearly everyone over 75 has at least one. But in rare cases, infants can have congenital cataracts. These usually are related to the mother having German measles, chickenpox, or another infectious disease during pregnancy, but sometimes they are inherited. A: There isn’t a proven method for cataract prevention They are simply, a natural lens protein buildup that is caused by aging. Fortunately, cataracts can be treated with proper surgery done by a certified ophthalmologist. Q: Is cataract surgery serious? A: All surgery involves some risk, so yes, it is serious. However, cataract surgery is the most commonly performed type of surgery in the Canada. Bochner Eye Institute surgeons have performed several thousand procedures. Choosing a surgeon with this much experience will reduce the risk of something going wrong. Q: Are thick glasses still required after cataract surgery? A: Rarely does anyone have to wear thick, heavy eyeglasses after cataract surgery these days. Most modern cataract procedures involve the use of advanced technology and IOLs (intraocular lenses) that often can correct your vision to 20/20 without glasses or contact lenses. In fact, premium multifocal IOLs and accommodating IOLs can even eliminate your need for reading glasses after cataract surgery. Q: What are possible side effects of cataract surgery? A: As with any surgery, pain, infection, swelling and bleeding are possible, but very few people experience serious cataract surgery complications. In most cases, complications or side effects from the procedure can be successfully managed with medication or a follow-up procedure. To reduce your risk for problems after cataract surgery, be sure to follow the instructions your surgeon gives you and report any unusual symptoms immediately.